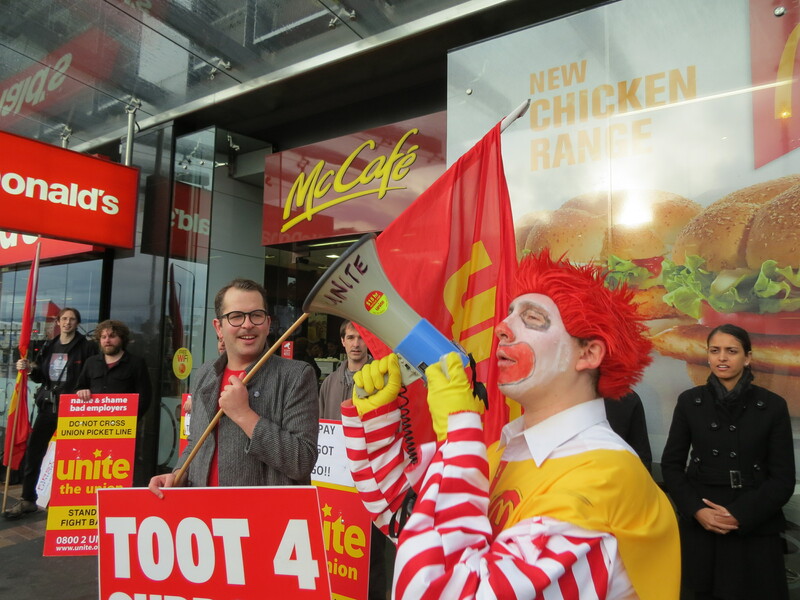 Saturday night, June 1, Wellington – Fightback against McDonald’s! As part of its 2013 conference Fightback (Aotearoa/NZ) is supporting a Unite membership campaign to lift pay and establish guaranteed hours of work at McDonald’s workplaces. Between 7pm and 9.30pm on Saturday June 1 Fightback members and other supporters of the Unite-led campaign will be going to McDonald’s stores throughout Wellington City. We’ll be telling customers why we think McDonald’s workers should be supported by the public. This comes on the back of last week’s strike at the Bunny Street store (pictured). If you want to join the fight meet at 6.30pm at Newtown Community & Cultural Centre @ corner of Rintoul & Colombo Sts, Newtown.